This Archimom is getting good at eating the whale! Two and a half years ago, when I started working on this project, the immediate goal was to prepare a decent set of Construction Documents and get a permit. Line weights mattered, line types mattered. I stayed on the project after the permit, and details mattered, simpler the better. 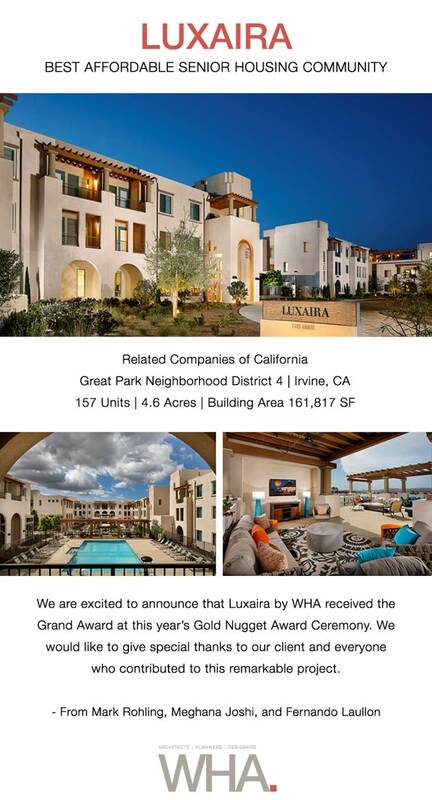 I worked on Construction Administration responding to the RFIs, reading through Submittals and substitution requests, sometimes standing my ground on code compliance, wrote blogs on the company website to showcase my project, helped marketing department prepare award entries, and here we are, Gold Nugget Grand Award Winner – PCBC 2018 to “Luxaira Best Affordable Senior Housing Community”. Here is the journey of the project at my desk…via my Instagram documentation. 4. Plank walk that turns into shoe safety talk… I usually wear my caterpillar boots, but here it is, a hard soled boot that’s acceptable on site, for those pesky rainy days to keep yourself warm and clean. 5. Rain delays don’t usually happen in California, but when it rains in California, it’s pours! Here it is, an OAC meeting after the rains. 6. Archiparent children will tell you the stories of being dragged to see their parents’ projects. There is no way our families can escape what we do. Here I am, one fine day, after dinner, dragging my husband and kids to the site. 8. And here it is, today…winning Golden Nugget at PCBC 2018. 9. And that moment of truth, the more you do, the more you can do. One item at a time, off the professional bucket list.